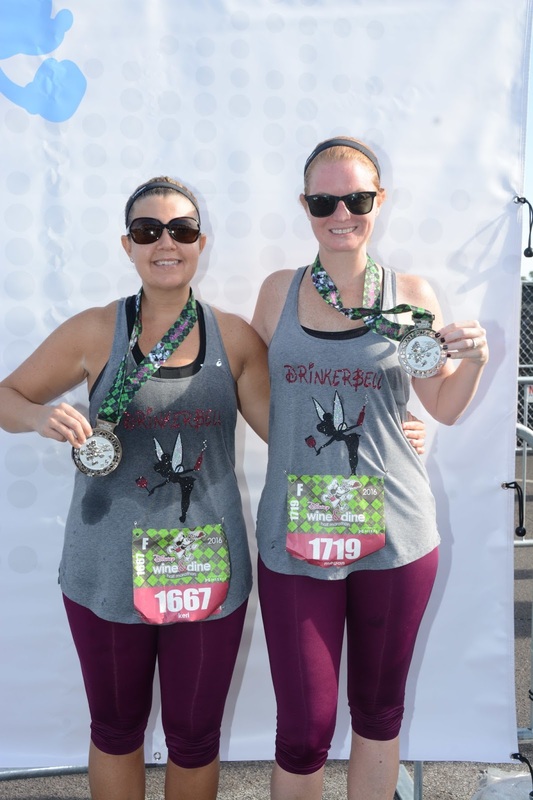 To say the 2016 Wine Dine Half Marathon blew my expectations is an understatement. There was a lot of negativity around the event. People were upset it was no longer a night race. Others were furious that Disney moved the after party to Sunday night. Most were unhappy that course since it didn't go through Hollywood Studios and was mainly on the streets surrounding Disney. From the day it was announced there would be changes to the Wine Dine Half, all you heard was constant negativity from others. I welcomed the changes with open arms. 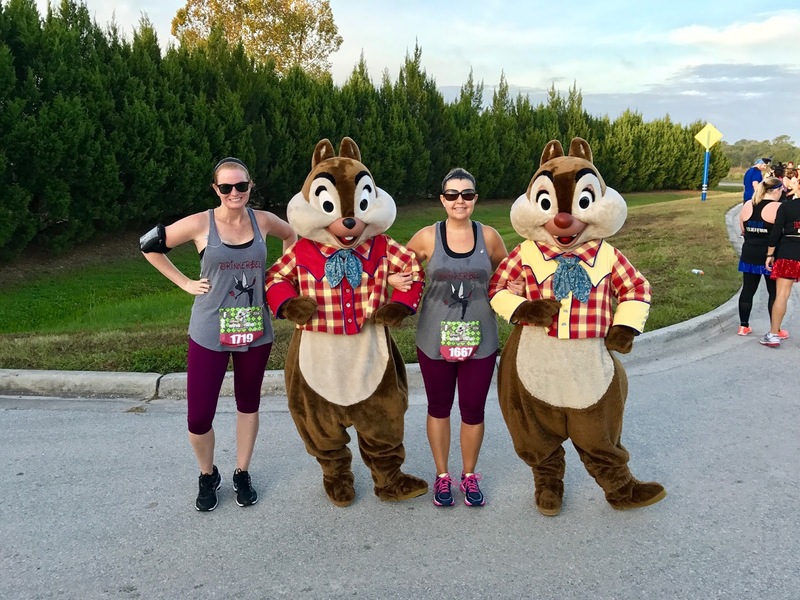 The 2016 Wine Dine Half was the most organized runDisney race I have ever ran. 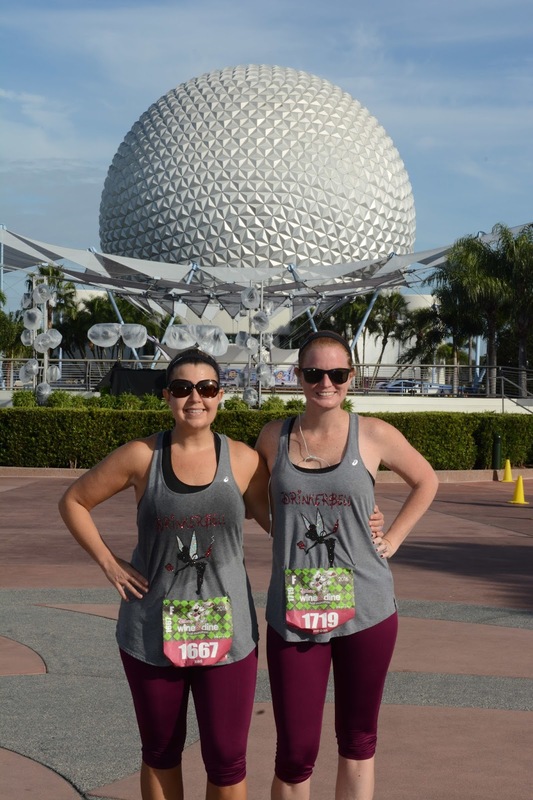 My best friend Keri and I signed up for the Wine Dine Half Marathon the day it opened for Passholder registration. The one time I ran this race, I had a problem with my nutrition. I don't take naps and was exhausted by the time the race started, let alone ended. Not to mention it was wicked humid the night of the race and I was so beat by the time we finished that I did not go to the after party. The years following they had issues with rain and wind. Moving it to the morning was a welcome change. Keri and I stayed at Hyatt Regency Grand Cypress which is a few miles from Disney. It was very conveniently located to Epcot, where we parked our car to get onto a bus that transported us to the start. Aside from waking up at 2:30am, the entire process was seamless. We had ZERO traffic, something I have never experienced at a runDisney race. Once we parked, we waited in what seemed to be a long line for a bus however we waited less than 5 minutes. Next thing we knew, we were at Wide World of Sports. The longest line I waited in all day was for coffee. We met up with Gelcys to say a quick hello and headed off to our Coral. It was time for us to go before I knew it. Keri and I ran 3/1 on the Galloway method. She had just ran a half marathon the week before and I am running on this Sunday so we wanted to take it easy. The first three miles were on W Osceola Parkway but Disney had a few character stops and entertainment along the way. 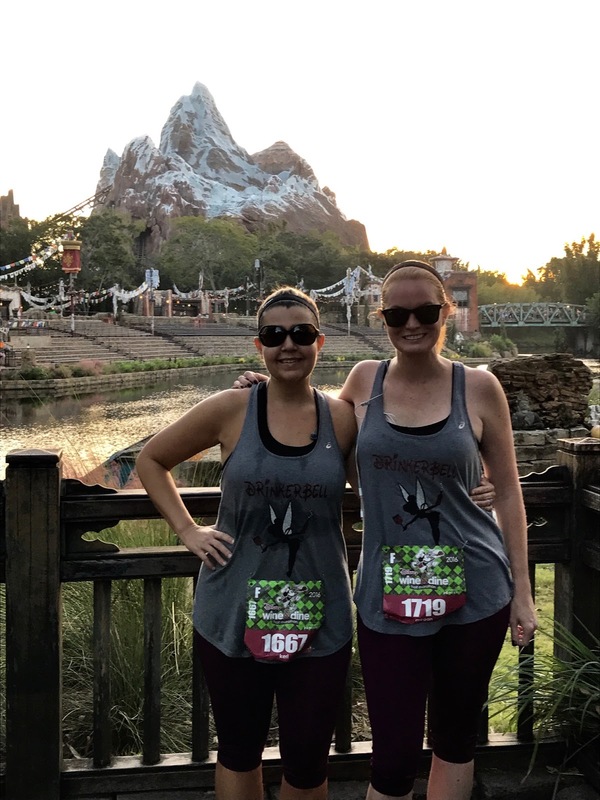 We entered Animal Kingdom right before mile 4 and spent a little over a mile running through the park. 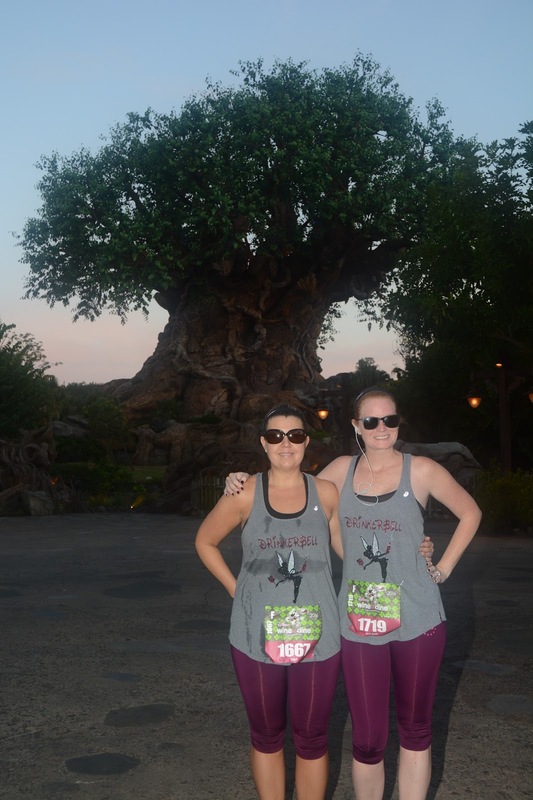 One thing I will say, you don't realize how hilly Animal Kingdom is until you run through it! We stopped for a few photos inside the park and continued on. 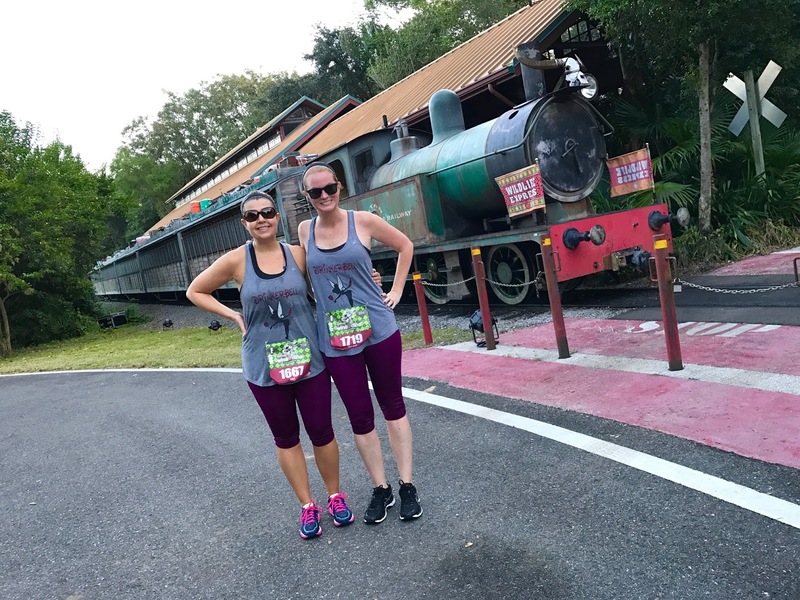 The one part of the course I was not thrilled to see was running through Disney's Water Treatment Plant at mile 7 - this also happened to be a water stop. Stinky! I planned on taking my Gu at mile 7 but decided to wait until mile 8 because this combination would surely make me gag. I was thrilled to find Chip and Dale dressed up in their finest Cowboy gear. Mile 8-9 brought us back onto World Drive where I was thrown off quite a bit. 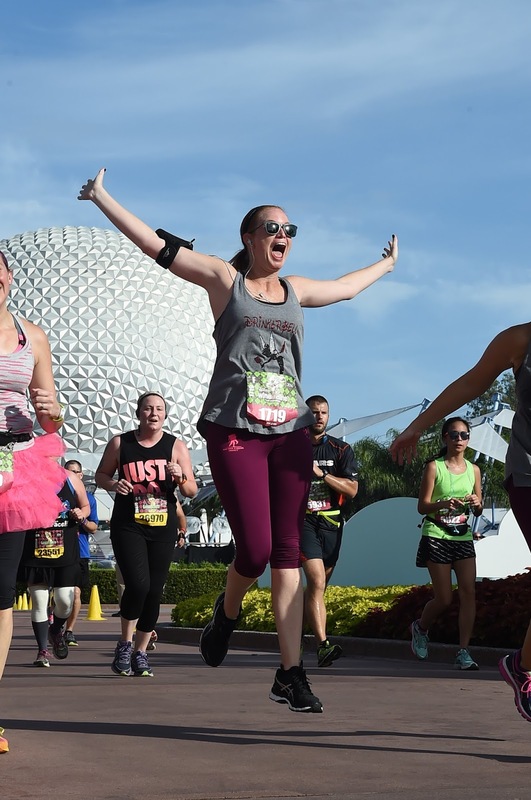 I've ran many Princess Half Marathons and Walt Disney World Half Marathons that took you on the same course on World Drive heading to Epcot. We were hitting mile markers way earlier than the other two races. I knew this meant one of two things - we would either be skipping the up and back before heading over the Epcot Overpass, or our time in Epcot was shortened. I was praying for the up and back to be what was cut. Around mile 9 I hit a small wall. I had severe cramps and between the pain relievers I was taking and the gu I took at mile 8, I got very dizzy. We lowered run walk ratio to 2/1 and had to keep telling myself there was champagne waiting for us at the hotel. I got over that wall around mile 12, right after I learned that the up and back was the part cut from the course. I was ecstatic. Keri will quickly tell everyone that I got the oddest timing of runners high imaginable. I was smiling, talking non-stop and basically telling everyone I loved them. I also got to take a picture of Clarabelle and Horace Horsecollar which made my day. The last half of the race, we ran along someone dressed as a giant Mickey Waffle. While in line waiting for our photo, I noticed she was behind me and knew this was a photo I had to get. She also smelled like maple syrup. However, I did not know it was the legendary runDisney costume queen, Karen Chu until I saw her face. I should have known it was her. We ran into fellow Drinkerbells! LOVE! We also saw a group of women dressed up as the Osbourne Family Spectacle of Dancing Lights. One sign said Back by Popular Demand - the next sign said The Osborne Family Spectacle of Dancing Lights - then holding signs of the Osbourne family - the last sign saying, Oh wait, wrong family. I loved that they made a joke of something so many people (myself included) are devastated about leaving Disney. On our final half mile, we got the brilliant idea that we wanted one of those cool photos of people jumping during the race. I would say our timing sucked and we aren't very good at jumping. Before we knew it, mile 13 appeared. We were both thrilled with this race. Sure we didn't go through Hollywood Studios and the course was on a lot of the roads through Disney, however I didn't get bored once. The weather was FANTASTIC. The support from the VoluntEARS was amazing as always. Plus the medal - it was awesome. 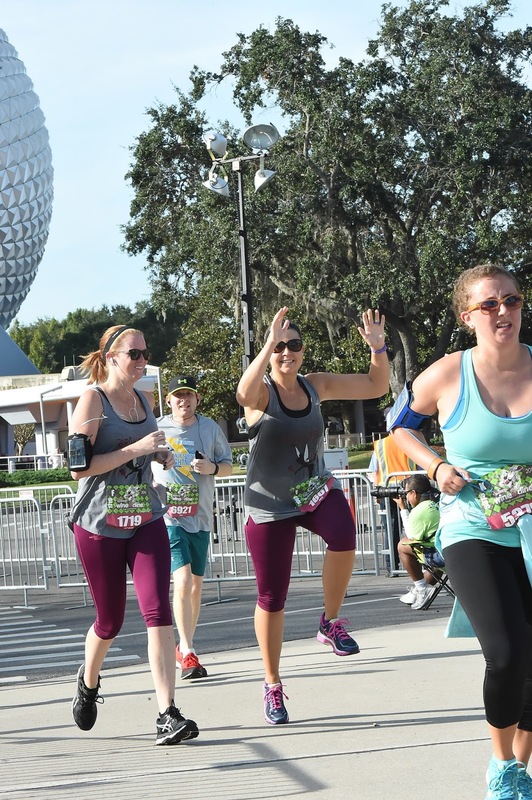 The entry fee is $199 - which is the standard pricing of runDisney Halfs. You get a $15 gift card to be used later that night at the After Party which takes place at Epcot's Food and Wine Festival. 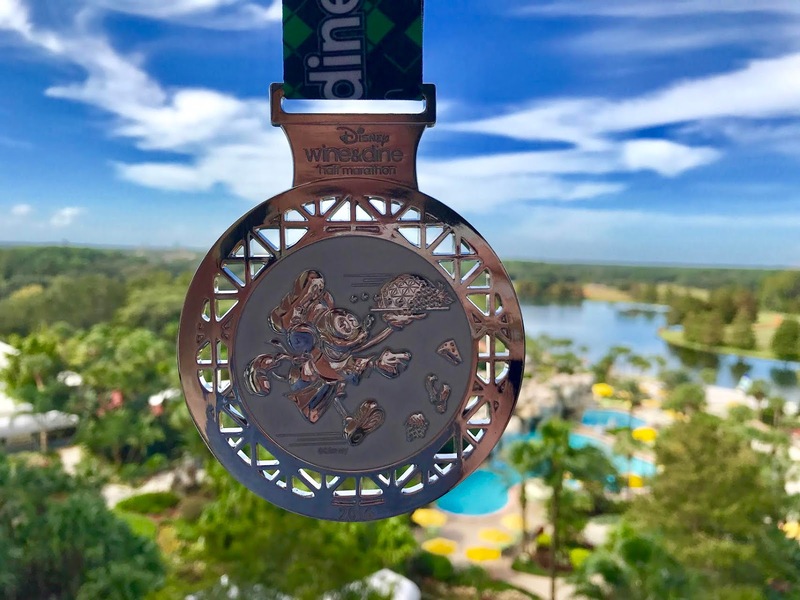 This is all included in the $199 so the Wine Dine Half is the best value of any runDisney races. 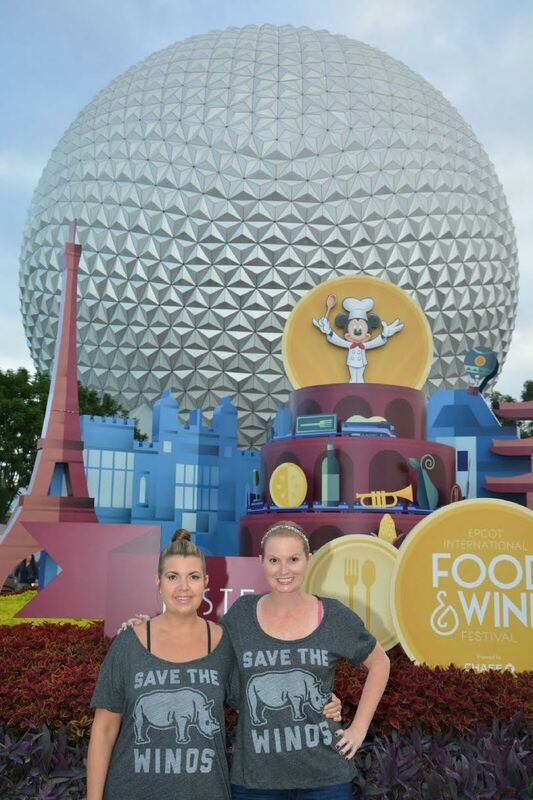 Plus celebrating in Epcot is the best idea EVER. 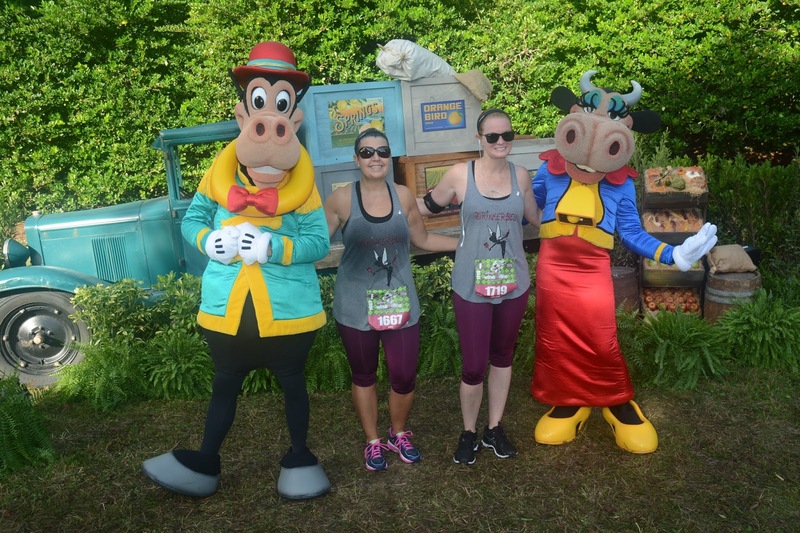 I will end this post by saying I never expected to write my recap of the Wine Dine Half before the Disneyland Paris Half recap (still haven't gotten our race photos - long story which I will cover) but with everything coming up over the next few weeks, I didn't want to wait too long on this recap. I really enjoyed the race as well. I absolutely agree that the organization was incredible.